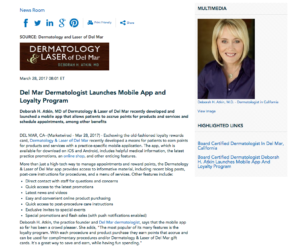 Deborah H. Atkin, MD of Dermatology & Laser of Del Mar recently developed and launched a mobile app that allows patients to accrue points for products and services and schedule appointments, among other benefits. 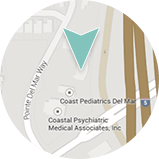 Del Mar, CA — Eschewing the old-fashioned loyalty rewards card, Dermatology & Laser of Del Mar recently developed a means for patients to earn points for products and services with a practice-specific mobile application. The app, which is available for download on iOS and Android, includes helpful medical information, the latest practice promotions, an online shop, and other enticing features. Individuals interested in the mobile app can find it in the Apple Store (for iPhone users) and in the Google Play store (for Android users). 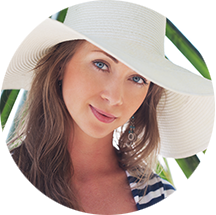 Led by board certified dermatologist Deborah H. Atkin, Dermatology & Laser of Del Mar offers medical and cosmetic skin care for people in the Del Mar and San Diego area. The state-of-the-art practice is equipped the latest equipment, including laser technology to help patients improve the health and appearance of their skin. With her patient-focused approach, Dr. Atkin and her team of skilled professionals can treat a comprehensive array of common and complex concerns, typically without the need for invasive methods. For more information about Dr. Atkin and Dermatology & Laser of Del Mar, please visit dermdelmar.com and facebook.com/dermdelmar.